A 14-metre stretch of sidewalk will soon power an entire office. Solar sidewalk outside the TRU Sustainability office. A new walkway is laying the ground for a greener campus at Thompson Rivers University. Over the summer, the university in Kamloops, British Columbia, installed 16 solar modules into a 14-metre stretch of sidewalk on campus. It’s touting the solar sidewalk as the first of its kind in Canada. The panelled walkway is wired into the university’s sustainability office. In a year, the panels should produce nearly 1,300 kWh, according to project lead Michael Mehta, a professor of geography and environmental studies at TRU. That would be enough to power all the lights, computers and appliances in the nearby office. The slip-resistant modules have been specially designed and reinforced to be walked and driven on. As part of the experiment, the walkway was intentionally installed in a high-traffic, tree-lined area. Each module is less than a quarter-of-an-inch thick, with solar cells optimized to respond to shade patterns that change throughout the day – when a set of cells drops in its ability to generate power the others make up the difference to maintain a consistent output. “If it can work in this location, solar sidewalks and perhaps even solar roads can work almost anywhere,” Dr. Mehta wrote in a recent blog post about the build. 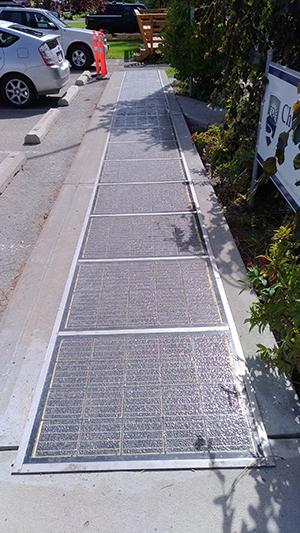 The sidewalk is a prototype for Dr. Mehta’s Solar Compass project, a compass-shaped path made of 64 solar modules. Solar Compass installation is scheduled to begin outside TRU’s Arts and Education building in late September. Once in operation, the solar road should offset the use of up to 40 computers eight hours a day over the course of a year. Dr. Metha says his bright idea is leading the way for energy-generating infrastructure – roads, sidewalks, parking lots, bridges – to eventually pay for its own construction, use and maintenance.